Since World War II, the San Fernando Valley has experienced one long population boom. St. Genevieve Parish was founded in 1950 to care for the spiritual needs of Catholics in Panorama City, Arleta and other nearby residential areas. Not long after, a parochial elementary school was built. Ground-breaking for St. Genevieve High School followed on December 7, 1958. Staffed by the Sisters of St. Joseph of Peace, St. Genevieve welcomed its first students in September 1959. The pioneer teachers and students shared quarters with the adjacent grade school until January 4, 1960, while final touches were being added to the new high school. Cardinal James Francis McIntyre dedicated SGHS in May 1960. The first graduating class of students accepted their diplomas in the spring of 1963. 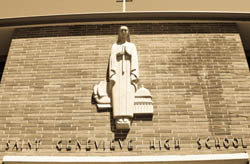 Since then, more than 8,000 young men and women have graduated from St. Genevieve High School. 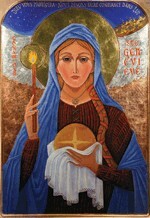 Patroness of Paris, b. at Nanterre, c. 419 or 422; d. at Paris, 512. Her feast is kept on 3 January. She was the daughter of Severus and Gerontia; popular tradition represents her parents as poor peasants, though it seems more likely that they were wealthy and respectable townspeople. In 429 St. Germain of Auxerre and St. Lupus of Troyes were sent across from Gaul to Britain to combat Pelagianism. On their way they stopped at Nanterre, a small village about eight miles from Paris. The inhabitants flocked out to welcome them, and St. Germain preached to the assembled multitude. It chanced that the pious demeanor and thoughtfulness of a young girl among his hearers attracted his attention. After the sermon he caused the child to be brought to him, spoke to her with interest, and encouraged her to persevere in the path of virtue. Learning that she was anxious to devote herself to the service of God, he interviewed her parents, and foretold them that their child would lead a life of sanctity and by her example and instruction bring many virgins to consecrate themselves to God. Before parting next morning he saw her again, and on her renewing her consecration he blessed her and gave her a medal engraved with a cross, telling her to keep it in remembrance of her dedication to Christ. He exhorted her likewise to be content with the medal, and wear it instead of her pearls and golden ornaments. There seem to have been no convents near her village; and Genevieve, like so many others who wished to practice religious virtue, remained at home, leading an innocent, prayerful life. It is uncertain when she formally received the religious veil. Some writers assert that it was on the occasion of St. Gregory's return from his mission to Britain; others say she received it about her sixteenth year, along with two companions, from the hands of the Bishop of Paris. On the death of her parents she went to Paris, and lived with her godmother. She devoted herself to works of charity and practiced severe corporal austerities, abstaining completely from flesh meat and breaking her fast only twice in the week. These mortification she continued for over thirty years, till her ecclesiastical superiors thought it their duty to make her diminish her austerities.